Below is a pic from from before. My nightstand was seriously lacking! 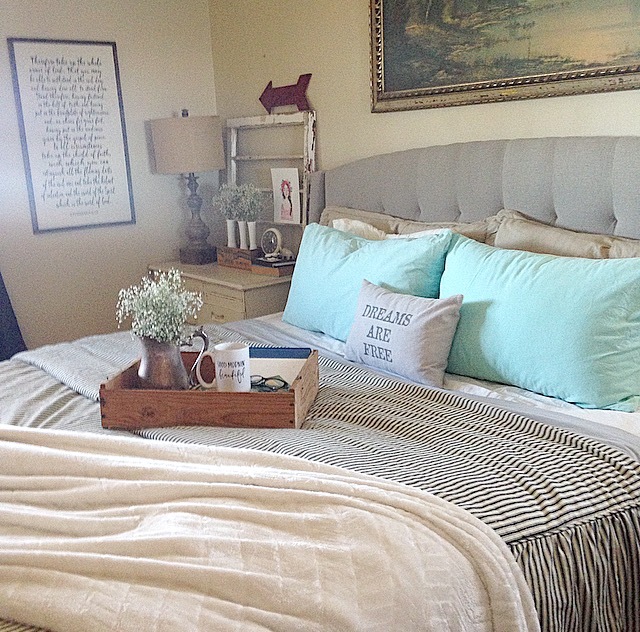 I purchased this comforter last fall and I love it! I found it in the Through the Country Door catalog. My favorite part about it is the corded edges, the ticking stripes, and how it drapes to the floor..my vision of a country bedroom. The picture above my bed belonged to my grandma and grandpa. I found it just hanging in their garage. It had been there for years and years but I had just came to appreciate it when I discovered my love for vintage and antique items. The look on my grandpas face was priceless when I asked him if I could have it for my bedroom. 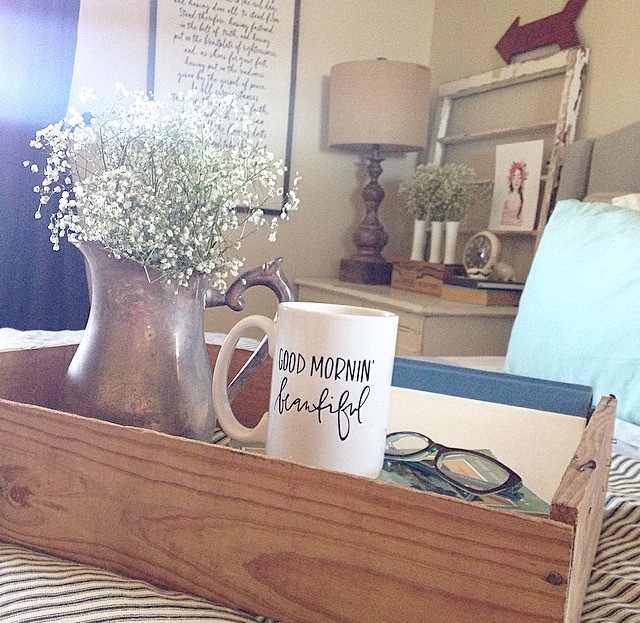 I have always wanted a tray on my bed like I see in the magazines. Sounds silly but I never seen a reason to have one. Although I have found myself using it! In the mornings I love setting on the bed and drinking my coffee while my little one watches cartoons. I looked for the perfect tray and couldn't find one I just loved! Then I remembered I had this old fruit crate setting downstairs that I picked up at a garage sale for five bucks. It was perfect for me. Mug is from Linen & Lace Shop. For my nightstand, this is where I really shopped my house for things I had. 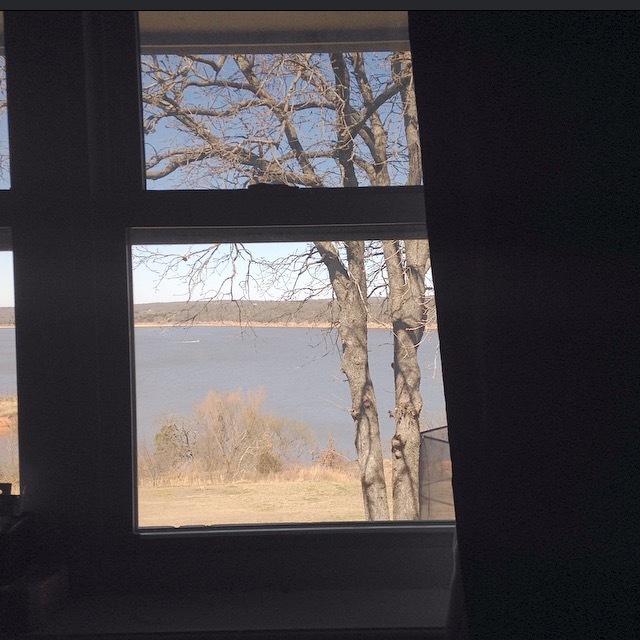 I started with this old window frame setting downstairs in my "things I bought and had to have at the moment" pile. It seems to have come in handy! I won the print in a giveaway on Instagram from @kristinebrookshire. I loved it because it reminded me of myself. I love layering when I decorate so I propped it up on the window. I had this lamp that circulates around the house because I never know were I quite want it. I love the texture it adds here. My bestie Collette sent me this old cheese box in a swap we hosted last summer. 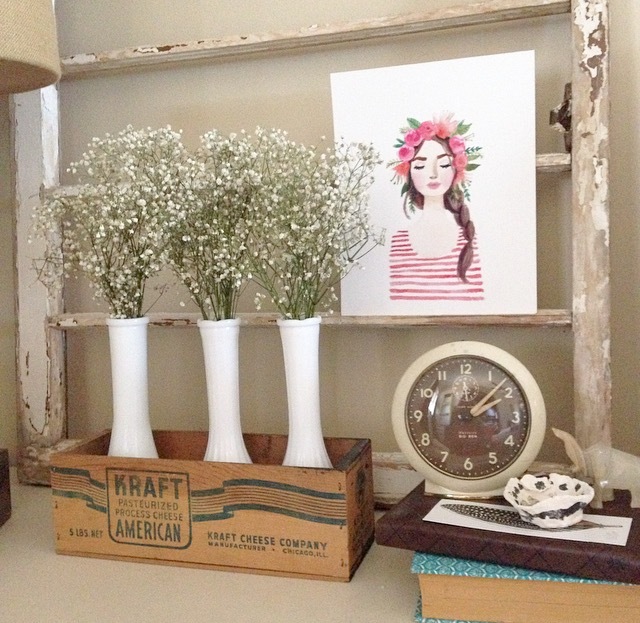 I had the milk glass vases already to I added some simple babys breath in it. My local grocery store sells huge bundles for 1.99 so it's easy to replace and I love the simplicity of it. My friend Jen on Instagram made me this arrow and I am so happy I found the perfect spot for it! 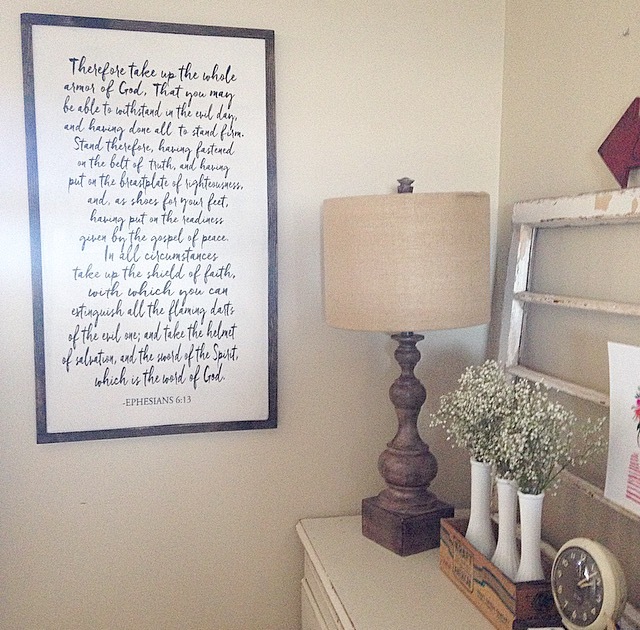 Armor of God sign is also from Linen & Lace and I feel like it ties the whole space together. It's so beautiful! I found some similar boxes online at Amazon for 9.99. Affiliate link below.. I wanted to add some color for spring. 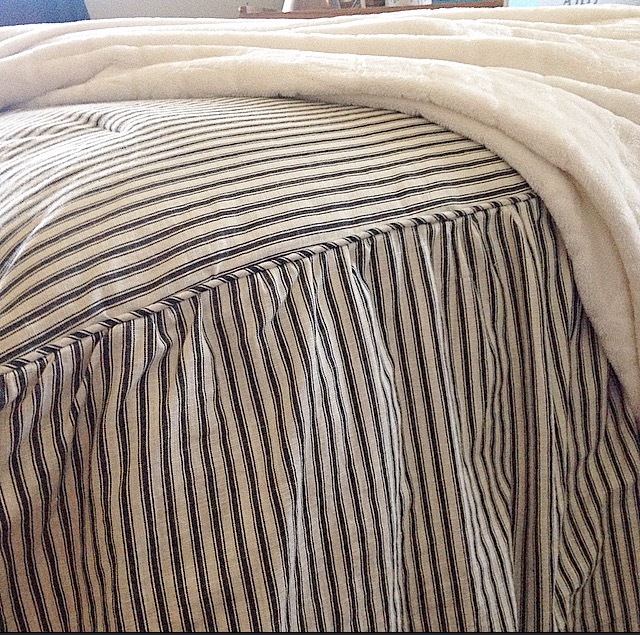 Bedface sheets lets you order mis-matched sheets! I love this idea. I went with a charcoal top sheet with a white flat sheet. 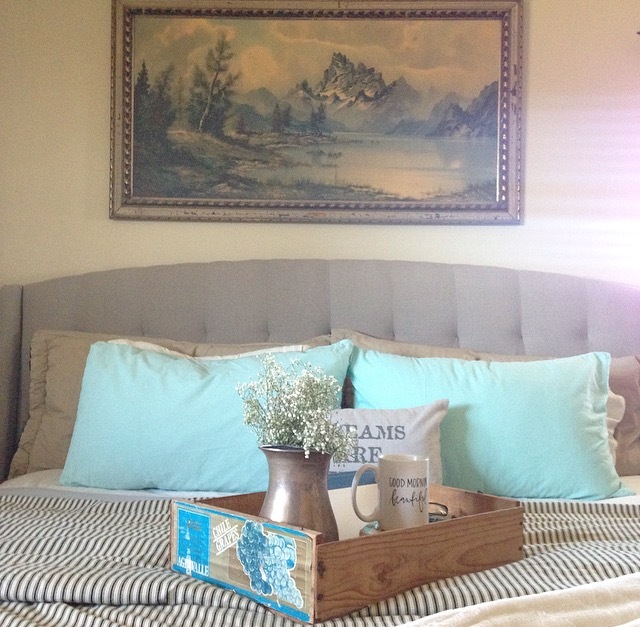 I chose "mint" colored pillow cases for my color. The sheets are amazing! I feel like I am climbing into a hotel bed every night. They even send a bag of popcorn with your order. How fun is that?! My next project is the other side of the room. 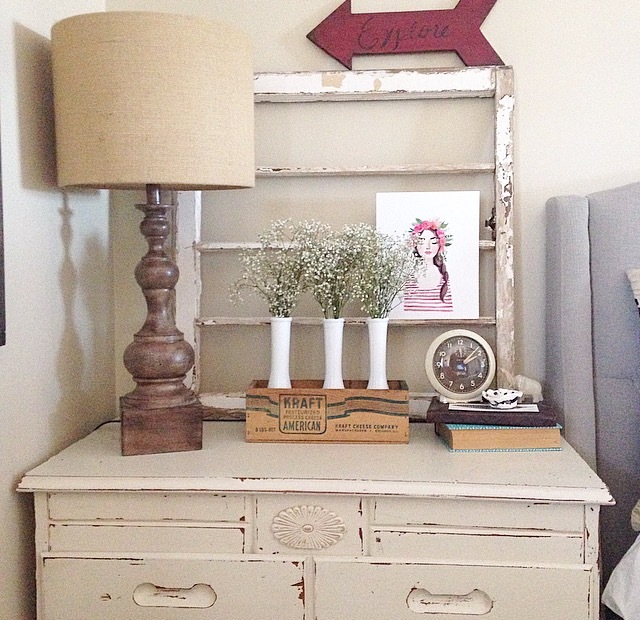 I have a huge chunky dresser, you know the ones you buy when you're first married...that has the whole matching set! I have slowly fizzled out the pieces except for the dresser. I hope to show you the other side soon! *"Dreams are Free" pillow from Tuesday Morning. It's all so pretty. 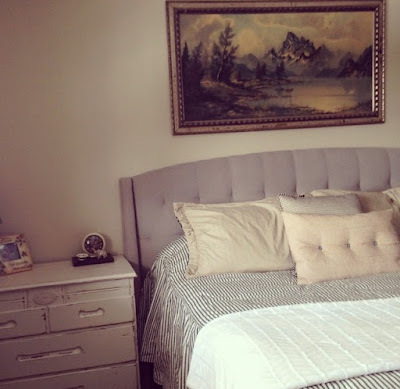 The perfect country bedroom! You have totally motivated me to work on mine.